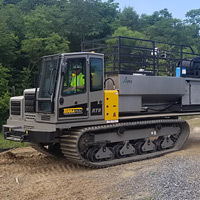 Terramac, LLC is a leading manufacturer of rubber tracked crawler carriers offering a variety of models which include: 360° rotating RT14R, rugged RT14, mid-sized RT9, and nimble RT6. Our carriers exert minimal ground pressure to conquer environmentally sensitive jobsites with ease and minimize ground disturbances making them ideal for hauling dirt to cap landfills. Terramac carriers are supported by a full line dealer network delivering localized sales, parts, service and support. 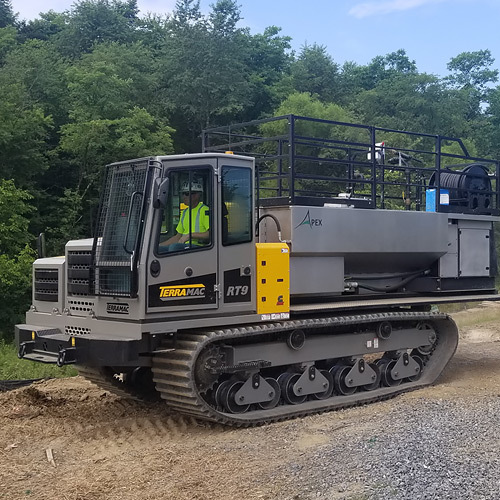 The Terramac RT14R is a rotating crawler carrier designed for all-terrain, heavy duty material hauling with increased efficiency and enhanced operator safety. The carrier boasts a 28,000 lbs. carrying capacity for hauling soil or alternative covers on landfills, and is built with a rugged 360-degree rotating upper frame to offload materials at any angle or on the go. The rotation on the RT14R ensures operators maintain a face forward position at all times and creates less track wear, resulting in reduced downtime and repair expenses for waste management contractors. With a ground pressure of just 8.3-psi, the RT14R travels effortlessly across sensitive environments and into tight spaces while minimizing ground disturbances. The exclusive tilt hood and rear cab enclosures on the RT14R provide easy access to the engine, fluids and filters to simplify routine maintenance. The Terramac RT14R is American made, built entirely of premium components and backed by a full dealer network spanning the United States and Canada for increased access to parts, service and support. 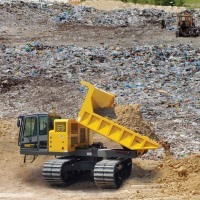 The overall versatility of the Terramac RT14R crawler carrier makes it the ideal piece of equipment for applying ground cover for waste management. The Terramac RT9 with specialty applicator is changing the way landfills apply their daily cover. 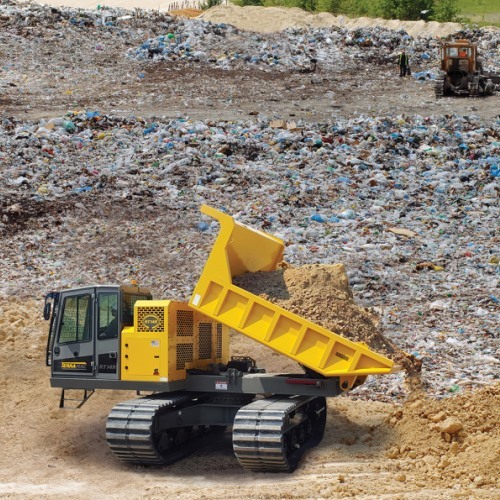 The low ground pressure of the crawler carrier allows the operator to transport the specialty applicator quickly and efficiently across the entire landfill. The precision of the application improves the daily capping procedure. With a ground pressure of just 6.4-psi, the RT9 travels effortlessly across sensitive environments and into tight spaces while minimizing ground disturbances. The unit features an easy to access engine, fluids and filters to simplify routine maintenance. The Terramac RT9 is North American made, built entirely of premium components and backed by a full dealer network spanning the United States and Canada for increased access to parts, service and support. The overall versatility of the Terramac RT9 with specialty applicator makes it the ideal piece of equipment for applying an alternative daily cover.